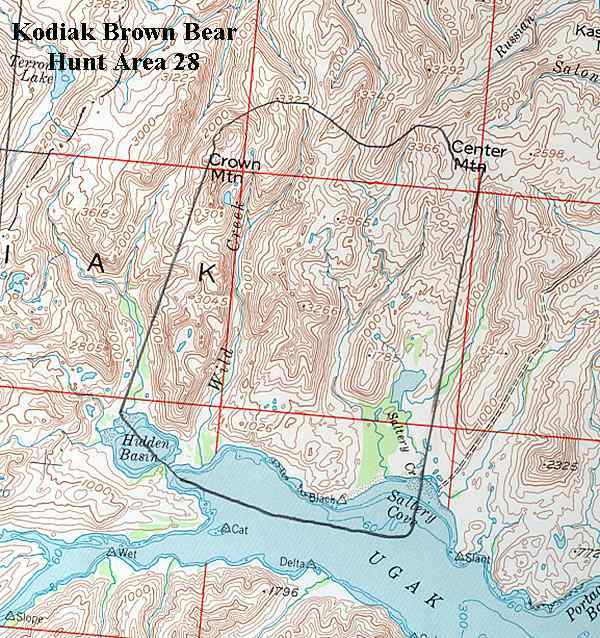 Northeastern Kodiak Island, including the northern portion of Hidden Basin, east of Rough Creek, Wild Creek, the west side of Saltery Creek, with the northern boundary being Center and Crown Mountains. See area map (Image file 82 kB). Broken terrain along Ugak Bay is vegetated by a mix of alders and grass/salmonberry meadows. As you move inland, dense alder thickets cover steep hillsides. Grass/salmonberry and cottonwood flats dominate areas in the lower elevations and river valleys. Alpine areas start at about 1500'. Primarily managed by the State of Alaska, with some private lands located around Hidden Basin and Saltery Lake.